Consumers have a right to expect that products they buy work properly and do not present an unreasonable risk of causing illness or injury. Under the ACL, consumer products are expected to meet the consumer guarantee to be of acceptable quality, including being safe. Banned products cannot be sold. Products or product-related services that are subject to mandatory safety or information standards must comply with those standards before they are offered for sale. Products subject to voluntary recall must be effectively removed from supply chains. In 2016 the ACCC’s priority under Deliverable 2.3 was the effectiveness of actions that suppliers take to recall unsafe consumer products. In 2017 the ACCC’s priority is working with internet platform providers to prevent the supply of unsafe products into Australia. In May 2016 we commenced an audit program to examine the effectiveness of voluntary recalls being conducted by businesses who had supplied Infinity cable. We reviewed the progress of and recall strategies employed by 20 businesses. 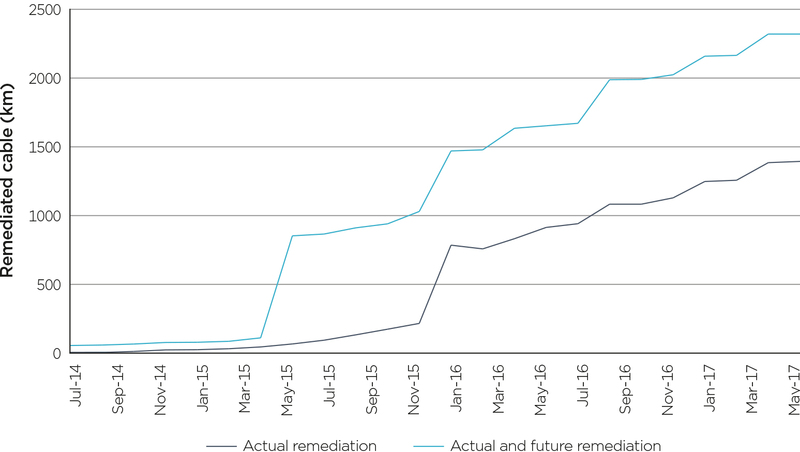 We found that the majority of businesses were delivering the agreed recall remediation plan. Due to the size of the Masters (now Woolworths) recall, we engaged an independent auditor to review that recall. The auditor reported positively, estimating that Woolworths was on track to complete the remediation of Infinity cable by December 2018.
developing product safety compliance strategies. We will always prioritise the assessment of product safety issues which have the potential to cause serious harm to consumers. The ACCC applies a risk-based approach to product safety. We receive and assess information about product safety issues from diverse sources, including reports, mandatory reporting, global recalls, media and the health system. Product safety issues with potential for serious or widespread harm to consumers are given priority. referring a matter for enforcement consideration. If our safety assessment indicates issues relevant to other regulators we will take appropriate steps to share information, as permitted by law. Likewise we may also assist with consumer safety responses to complement the work of other regulators. For example our participation in the Heads of Workplace Safety Authorities national working group for management of asbestos assists with the delivery of a seamless national approach to asbestos in consumer and other products. We value voluntary compliance and will work cooperatively with stakeholders where this is appropriate. Where suppliers fail to comply with product safety laws, we may consider enforcement action. We consider each option against the priority of achieving the best safety outcome for consumers. Voluntary recalls continue to be the main solution that businesses adopt when removing unsafe consumer products from the market. We support the effectiveness of voluntary recalls through the Recalls webpage on the Product Safety Australia website. When a recall is notified, we promote it via social media to increase exposure of the recall to relevant audiences. In 2016–17 the most successful re-posting of a recall was for some Bonds baby items that lacked required safety warning labels. Our organic Facebook post to promote the recall reached 834 140 consumers. The next two highest performers were recalls of Mazda liftgate stay dampers (467 486 people reached) and Dometic WAECO portable fridge freezers (326 403 people reached). Suppliers must advise the Commonwealth Minister within two days of commencing voluntary recall action. To ensure that consumers receive the earliest notice of a recall that may affect them, we have aimed to publish 80 per cent of voluntary recalls within 48 hours of agreeing to legally correct wording with a supplier. From 2017–18 this target will be revised to be 80 per cent of voluntary recall notifications to the ACCC to be published in seven calendar days or less, including assessment and engagement with suppliers. Much of our time on voluntary recalls is spent assisting businesses to develop appropriate messaging to include in their recall notifications to ensure that consumers understand the risk of continuing to use a recalled product. During the year we published a total of 592 recall notifications—264 related to general consumer goods, 240 to motor vehicles, 52 to food and 36 to therapeutic goods. When we receive the notification of voluntary recall (on behalf of the Minister) we assess the risk and hazard that the product presents to consumers against the recall strategy that the supplier proposes to ensure the recall is effective. If we are unable to reach agreement on a matter we may escalate the matter for further investigation. On one occasion this year we recommended that the Minister issue a safety warning notice under the Australian Consumer Law. This was to alert consumers that a voluntary recall of Polaris youth quad bikes did not cover the full extent of potentially unsafe models. A safety warning notice is not punitive, it is a protective measure. In this case the supplier extended the recall shortly after the Minister issued the notice. This year we reviewed our voluntary recall monitoring processes. As forecast in the ACCC and AER 2015–16 annual report, we also reviewed the recall reporting obligations of suppliers that are engaged in active recalls to ensure that reporting frequency and duration remained proportional to risk. We also completed the audit program we commenced in May 2016, which reviewed the effectiveness of the Infinity cable recall. We prepared guidance for small business on the importance of tracking and traceability of consumer products and communicating and advertising a recall. These publications will be released in early 2017−18. Based on Australian Bureau of Statistics advice, we will also publish versions of these guides in Vietnamese, simplified Chinese, Italian, Greek and Arabic, to help us to reach the discount variety retail sector and small online sellers. In October 2016 we completed some further work on our risk approach and commissioned the Commonwealth Scientific and Industrial Research Organisation (CSIRO) to help us review the data we hold about incidents and injuries so that we can scope the feasibility of a data-driven approach to product safety priorities. Our audit process commenced with an internal review of our past accounting of recall progress. This included review of records received from the Infinity Cable Company liquidator and amounts that suppliers nominated they were recalling when they first notified their recalls. provide an evidence base for advice to the ACCC and the Minister about actions needed, if any, to improve the effectiveness of the recalls. how the supplier intends to respond. If our preliminary assessment identifies a safety concern, we will then undertake a more detailed assessment. This may include seeking advice from suppliers about their quality assurance programs and safety testing. Where needed, we will commission product testing. We received 3007 mandatory reports in 2016–17. We referred 1482 reports to other regulators and assessed 1525 ourselves. We conducted a preliminary assessment of 86.6 per cent of reports relating to serious injury or death within seven days. This year we also reviewed the performance of the mandatory reporting provisions which were introduced with the ACL on 1 January 2011. In the six-and-a-half year period from commencement of the ACL until our review date in early June 2017, the ACCC had received approximately 17 000 mandatory reports. On average 2600 reports have been received each year. Our review identified that the majority of reporting is being undertaken conservatively by suppliers. In the majority of cases the reports do not describe an incident involving serious injury or illness as defined in the ACL. Further, many reports describe circumstances that the legislation may not intend to capture. Details of actual reports cannot be released, but equivalent examples are feeling unwell from over-consumption of food or alcohol, a cut from picking up broken glass, or a chipped tooth from consuming a hard candy. Despite these issues, information received via mandatory reporting plays an important role in identifying emerging product safety hazards. Many voluntary product recalls are initiated through discussion of consumer injuries reported under the provisions. Such discussions often identify the likelihood of issues with similar products in supply chains which can be addressed proactively before further injuries occur. As a result of the recent ACL review, a CAANZ subcommittee will be considering our findings to inform the preparation of new guidance for suppliers about how to undertake mandatory reporting in compliance with the ACL provisions. New guidance will provide businesses with confidence about when reporting is needed, and will reduce the burden on businesses that may be over-reporting in a precautionary way. The ACCC makes recommendations to the Commonwealth minister responsible for consumer product safety about amending or developing product safety regulations to deal with products that have the potential to harm consumers. The ACCC consults with relevant stakeholders, including industry groups, consumer groups and other government agencies, in order to consider the impact on business and consumers and improve our policy formulation and decision-making. We periodically review mandatory product safety standards to ensure that they remain effective in a changing economy and continue to provide the intended safety outcomes for consumers. Product safety standard reviews are part of our ongoing contribution to the Australian Government’s policy objectives, including its regulatory reform agenda. On 16 March 2017 the Minister for Small Business, the Hon. Michael McCormack MP, imposed a national interim ban on certain decorative alcohol-fuelled devices, also known as ethanol burners, because of the risk of injury to consumers from uncontrolled fires. Alcohol-fuelled devices are designed for domestic use and are used primarily to improve the ambience of the home. There are three common types of alcohol-fuelled devices: those that require installation in a fixed position, those that are freestanding, and those that are designed to sit on top of furniture, such as tables. They produce a flame using alcohol such as methylated spirits or ethanol in liquid or gel form. They are especially dangerous when being refuelled because the flame is sometimes invisible and the fuel can explode if poured on an open flame or hot surface. Since 2010 there have been reports of at least 113 separate incidents related to decorative alcohol-fuelled devices resulting in an estimated 105 consumer injuries. Of the 113 incidents, at least 36 resulted in house fires. Injuries include second- or third-degree burns requiring intensive care, skin grafts, operations, lengthy hospital stays and physiotherapy. those that meet the minimum dry weight (8 kg) and footprint (900 m2)—and, if these requirements are met, have a removable fuel tank (with warning) or come with a fuel container with a flame arrester (with warning). The national interim ban was in force for an initial period of 60 days and was extended for two further periods of 30 days. The national interim ban ended on 14 July 2017. The ACCC has completed its investigation into a solution to address the hazards posed by decorative alcohol-fuelled devices. In June 2017 we recommended to the Minister that he make a mandatory safety standard for decorative alcohol-fuelled devices to come into force when the national interim ban ends. In July 2016 we completed the review of the interim ban for self-balancing scooters. The review resulted in the introduction of the mandatory standard for self-balancing scooters, which includes various battery and battery control system requirements. In March 2017 we completed the review of the mandatory safety standard for elastic luggage straps. The updated mandatory standard requires suppliers to label luggage straps with a revised warning statement advising consumers not to overstretch straps and to keep their face and body out of the rebound path. In March 2017 we also completed the review of the mandatory safety standard for portable soccer goals. After review it was determined that the current mandatory standard is addressing the hazard adequately, and the Minister for Small Business endorsed the status quo. In April 2017 we completed the review of the mandatory standard for children’s nightwear. The updated mandatory standard adopts the most recent version of the Australian/New Zealand Standard AS/NZS 1249:2014 Children’s nightwear and limited daywear having reduced fire hazard. In May 2017 we completed the review of the mandatory standard for babies’ dummies. The updated mandatory standard adopts the most recent version of the Australian Standard AS 2432:2015 Babies’ dummies and also adopts the European Standard EN 12586:2007+A1:2011 Child use and care articles—Soother holder—Safety requirements and test methods. The adoption of international standards, where appropriate, aligns with the government’s Industry, Innovation and Competitiveness Agenda, under which the government adopts the principle that, if a system, service or product has been approved under a trusted international standard or risk assessment, Australian regulators should not impose any additional requirements unless there is a good and demonstrable reason to do so. 1. We encourage compliance by educating and informing consumers and businesses about their rights and responsibilities under the Act. 2. We enforce the ACL by resolving possible contraventions administratively and by litigation. 3. We work with other agencies to implement these strategies. The ACCC investigates possible non-compliance with mandatory standards and bans. We receive information on possible non-compliance from a range of sources. We assess these matters and take action where warranted by issuing warnings or seeking clarifications, instigating broad compliance or educative activity or taking appropriate enforcement action. We regularly survey the market to identify compliance concerns in relation to existing regulations and bans and to assist in the identification of new hazards. In partnership with ACL regulators and other organisations, we also coordinate and conduct joint surveillance, testing and compliance activities to address safety concerns. During 2016–17 we conducted 1263 inspections of wholesalers, retailers and online suppliers against 29 mandatory safety standards, bans or product types. Inspections resulted in suppliers withdrawing eight product types from sale. Non-compliance identified in market surveillance activities resulted in 27 non-compliant product types being voluntarily recalled by suppliers. Recalled products include bean bag covers (non-compliance with mandatory safety standard), vehicle recovery straps (non-compliance with mandatory safety standard), vehicle jacks (non-compliance with mandatory safety standard), children’s nightwear (non-compliance with mandatory safety standard), child car restraints (non-compliance with mandatory safety standard), children’s toys (non-compliance with mandatory safety standard), and Infinity cable (unsafe product). Educating suppliers and consumers about potential consumer product safety risks is one of the strategies we use to address emerging hazards. We continued to provide guidance to industry on existing and new product safety regulations. We also prepared guidance for small businesses and industry stakeholders affected by the Infinity cable recall. Reaching new audiences on social media is a challenge we try to meet. This year we tried a few different approaches. We trialled some paid Facebook promotions to see if we could extend the organic reach of our Facebook posts. We tried this for our Infinity cable and button battery safety videos and were pleased with the result. We reached 567 191 people with the Infinity cable video and 467 043 people with the button battery video. We commenced promotion of the button battery video on 28 February to coincide with the last day of summer or ‘Summer’s Day’, in memory of Summer Steer, the Queensland child who tragically died following ingestion of a button battery. We also used Twitter to promote our safety messaging and product safety recalls. Comparison of the Twitter and Facebook reaches shows that interest generally varies by topic, which reflects the difference audiences of each channel. The most popular recalls for the Twitter audiences were the Samsung Galaxy Note 7 (8590 impressions), the Mercedes Benz front passenger airbag (7226 impressions), Kambrook essentials microwave oven (6582 impressions), Techtronic AEG chainsaw (6147 impressions), Radio Systems AC plug adaptor (5907 impressions) and Kogan drome quadcopter (5775 impressions). Throughout the year we also added product safety messages to Facebook posts to coincide with popular culture dates and events. For example, on international Star Wars Day on the 4th of May, which plays on the famous phrase ‘May the force be with you’, we posted a ‘May the 4th be with you’ message. The post presented a fictitious product recall of an R5 astromech droid from the Star Wars movie. It proved successful for a number of reasons. We had almost 14 000 reactions on Facebook, exceeding our modest goals, as did the reach. Twitter also received above average numbers of retweets and likes. Facebook statistics revealed that more men engaged with the post than average (currently men are only 35 per cent of our Facebook page fans). Both Facebook and Twitter favour rich-content posts. The GIF video included in our post was instantly recognisable, and tied in well with our role in publishing product safety recalls. Each year in Australia, over 1500 people aged 65 years and over are hospitalised after falling from a ladder. Nearly two-thirds of those injuries occurred in or around their home. In 2016 the ACCC participated in the national EIAC campaign ‘Ladder safety matters’, which encouraged older Australian men to stop and think about safety before they use a ladder. The Safe Summer campaign was a social media campaign aimed at holidaymakers and consumers who are buying gifts for Christmas or using products for summertime activities. It encouraged consumers and holidaymakers to stay safe during summer by checking for unsafe products, using other products safely and heeding product safety warnings. Consumers were advised to check that Christmas gifts are suitable for the age of the child and do not present choking hazards or contain accessible batteries. Each year, toppling furniture and TVs cause hundreds of serious injuries to children, and around two deaths of young children. The ACCC participated in the national EIAC campaign to raise awareness of the dangers of unstable furniture and televisions, which made use of educational material previously developed by the ACCC, combined with new content developed with the committee. A key element of the campaign was a safety video we produced in 2016: Toppling furniture safety—anchor it and protect a child. To take a coordinated approach to the problem of toppling furniture and televisions, a National Toppling Furniture Strategy was also developed in collaboration with state and territory consumer safety regulators to engage with industry and develop a suite of safety initiatives with multiple stakeholder involvement. The ACCC and other members of EIAC launched the strategy in April 2017. It will continue throughout the remainder of 2017. The cornerstone of the strategy is the Best practice guide for furniture and television tip-over and prevention, developed by the National Retail Association in coordination with the ACCC and announced by NSW Fair Trading under the EIAC education initiative on 3 April 2017. The strategy involves engagement with industry to promote widespread adoption of the guide and an information kit for suppliers to assist with staff training. It incorporates printed point-of-sale posters and postcards. In addition, the strategy implemented paid social media educational material and other targeted media content and surveillance activities. The guide urges suppliers to supply anchor devices, as defined by the guide, with any tall furniture and large televisions at the point of sale. It also recommends that manufacturers apply the Australian safety standards to ensure that all furniture, including freestanding furniture, is as stable as possible so that it can accommodate top-heavy loading with TVs and other household items. The guide urges retailers to display in-store signage and provide warnings in assembly instructions, on packaging and on the product. It also recommends that retail staff be trained to talk to customers about the hazards of unstable furniture. The ACCC and Health Canada are also taking a lead role in developing consumer education materials for the OECD, which has made toppling furniture its product safety priority for 2017. OECD members will jointly launch the campaign beginning with a week of intensive social and print media activity in November 2017, involving jurisdictions from around the world. In September 2016, along with our co-regulators, we launched the National Strategy for Improving the Safety of Button Battery Consumer Products. The strategy promises two years of concerted action to reduce the risks posed by button batteries. Button batteries are used in a broad range of household products such as remote controls for appliances and electronics, computers and calculators, garage door openers, flameless candles, toys and games, cameras, torches and book lights, kitchen scales, and musical greeting cards. They are also used in clothing and accessories, including key fobs and children’s jewellery. an exploration of the case for a mandatory standard if the abovementioned measures fail to deliver sufficiently safe consumer outcomes. The ACCC produced a video, Button battery safety in the home, to educate parents and carers and give them practical advice to reduce children’s exposure to button batteries. At the same time, industry also launched a voluntary (non-statutory) industry code for button batteries to assist businesses. The voluntary code was developed by industry with the ACCC’s assistance. It encourages the supply of consumer products with secure battery compartments, safer packaging and labelling. redesign and retooling of office and stationery products to include secure battery compartments. Since 1 July 2016 suppliers have undertaken 18 voluntary recalls (covering approximately 36 items, including minor style variations) following identification of button-battery hazards. This is significantly more than the number of similar recalls undertaken in the 2015–16 financial year (12 recalls covering approximately 29 items, including minor style variations). Businesses must ensure that products they supply comply with mandatory product safety and information standards and are not banned under the ACL. The supply of a product that does not comply with a safety standard is a breach of the ACL, and suppliers may be subject to enforcement action where we consider this is warranted in accordance with the priorities outlined in our Compliance and Enforcement Policy. In August 2016 the Federal Court ordered Ozsale Pty Ltd (Ozsale) to pay penalties of $500 000 for breaches of the ACL relating to safety issues with five children’s nightwear garments sold by Ozsale which did not comply with the applicable mandatory Australian standard. Ozsale is a membership-based online retailer that sells clothing it purchases as excess inventory from mostly overseas suppliers. The ACCC instituted proceedings against Ozsale in December 2015. The ACCC alleged that Ozsale sold over 200 non-compliant garments to Australian consumers and had over 11 000 non-compliant garments available for supply to Australian consumers. Of particular concern were the Orange Superhero Pyjamas, because the fabric type and the length of the cape made them particularly dangerous. one of these garments was non-compliant due to composition and design failures. The Federal Court declared that Ozsale had contravened the ACL with respect to each of the five garments and ordered an injunction restraining Ozsale, for three years, from suppling children’s nightwear garments that are subject to a safety standard unless the garment complies with the safety standard. In addition to penalties, Ozsale was ordered to implement a compliance program and make a contribution of $50 000 to the ACCC’s costs. Ozsale recalled the garments that were the subject of these allegations. In November 2016 the ACCC accepted a court enforceable undertaking from Philip Morris Ltd (Philip Morris) in relation to the supply of Choice Signature Bold and Choice Signature Classic cigarettes (the Choice cigarettes) which did not comply with the mandatory Reduced Fire Risk Standard (the RFR Standard). Under the RFR Standard, cigarettes sold in Australia must self-extinguish when left unattended. Before the RFR Standard was adopted, discarded cigarettes and related products started over 4500 fires and killed an average of 14 people each year. Cigarettes that do not meet the RFR standard also pose a significant risk in the Australian environment in that they can cause bushfires and associated injury and damage. Between 1 September 2015 and 14 October 2015, Philip Morris supplied 306 000 packs of Choice cigarettes that did not comply with the RFR Standard. Philip Morris self-reported its supply of non-compliant cigarettes to the ACCC after its test results confirmed the Choice cigarettes did not comply with the RFR Standard. It initiated a voluntary recall on 17 October 2015. Philip Morris has also agreed to donate $300 000 to the NSW Rural Fire Service. We finalised the following cases in 2016–17. Pecuniary penalties of $500 000. Compliance program Contribution of $50 000 to the ACCC’s costs. The ACCC alleged that, between July 2014 and October 2015, Ozsale sold children’s nightwear which did not comply with the mandatory Australian safety standard and made a false or misleading representation about the fire risk of one garment. For details see the case study on page 122. We instituted the following cases in 2016–17. The ACCC alleged that that Thermomix misled customers about their consumer guarantee rights, failed to comply with mandatory reporting requirements for injuries arising from the use of the appliances, made false representations and engaged in misleading conduct regarding the safety of the TM31 model, and made false and misleading statements about its 2014 recall. The ACCC accepted a court enforceable undertaking from Philip Morris Ltd not to supply cigarettes that do not meet the mandatory Reduced Fire Risk Standard. The ACCC accepted a court enforceable undertaking from Zen Sensation Pty Ltd not to supply cigarettes that do not meet the mandatory Reduced Fire Risk Standard.